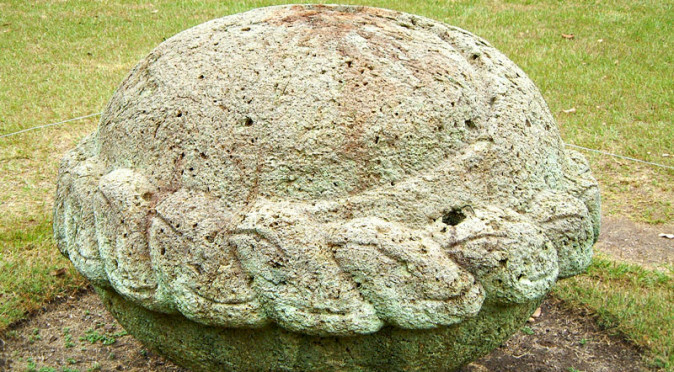 The “Screaming Macaw” from the Ball-Copán is located in a plush, fertile valley created by the Copan River that runs alongside the city. The valley made an ideal location for prehistoric communities. Hunting, fishing and farmland were all found in abundance and the earliest stone structures date back to the 9th century BC, with the earliest signs of settlement going back to the 3rd Millennium BC. The Copan Valley was also ideally located for trade too, with the Copán River connecting with other important rivers, such as the Motagua River, in a network that ran almost from the Pacific out to the Atlantic. 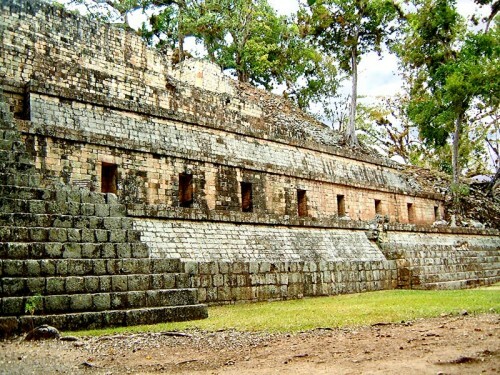 Copan is located about halfway between the two coasts where the land narrows to the shortest distance for around 400 miles in either direction. 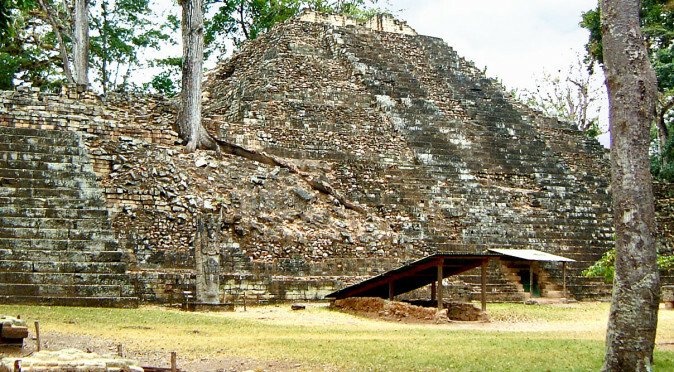 Not only was it well connected, but Copán was at the heart of the only jade mining region in Mesoamerica. Jade was a highly prized commodity in Mesoamerica, offering rarity, beauty and function – as it could be polished and shaped to produce sacred knives as well as hard-wearing ornaments and jewellery. This trade would have been flourishing during the Olmec era, from 1500BC to 400BC, as they are renowned for using a particular style of jade known as “Olmec Blue” which came from this region. 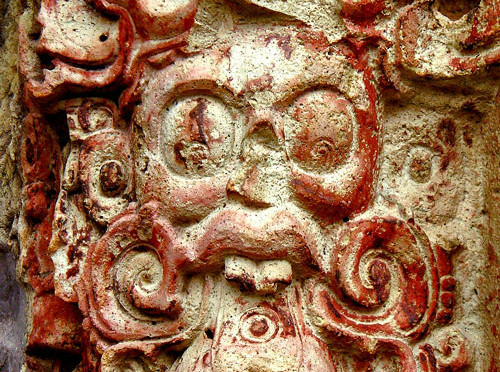 The first recorded date at Copan is the 14th October 321BC1, but it was recorded several centuries later and there is no certainty as to what the event was. 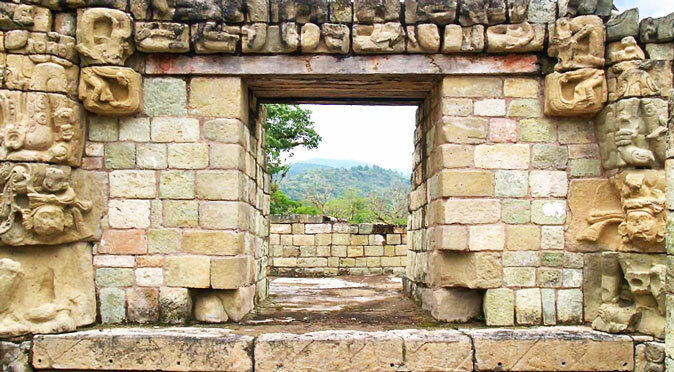 W1064QSF: Altar QWe have to move forward to 426AD for the first recorded historical event – the founding of Copan – which was known as “Ox Witik“. 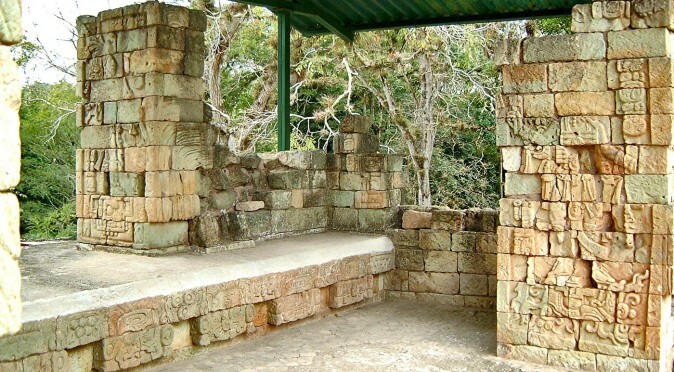 The founding is recorded in some detail on Altar Q, which tells is that the first ruler, K’inich Yax K’uk’ Mo’, was crowned elsewhere and then despatched to take the throne at Copan, travelling for at least 153 days to arrive2. The place he came from is recorded in the text, but it is not known where this place was. 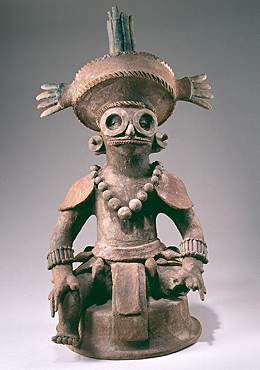 He is pictured on Altar Q and a censer lid found within Temple 26 dressed in a distinctly Teotihuacano attire, with the goggles of Tlaloc and a serpent shield (figs W1064QSF & W1106Y). His mortuary temple, which has been found buried deep within the layers of Temple 16, was made in the Talud-Tablero style that is also synonymous with Teotihuacan. He was buried with a tripod pot in the Teotihaucano style and his wife was found buried with mirrors from the Teotihuacan region3. This leaves little doubt that Teotihuacan was strongly involved in founding the city of Copan, despite being located over 1000km away. 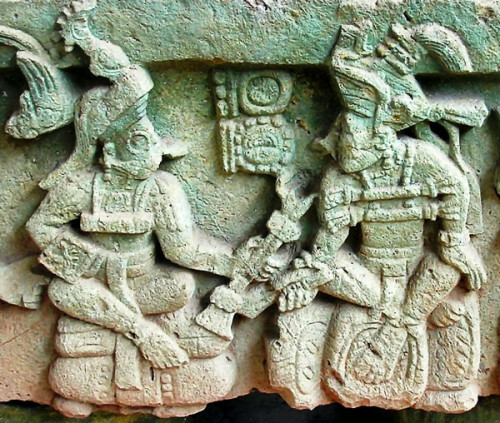 However, evidence uncovered at Copán, Quirigua and Tikal, shows that Copan was closely tied to Tikal throughout its history and DNA testing on the remains of K’inich Yax K’uk’ Mo’ has proven him to be from the Tikal region. Tikal is substantially less than 153 days travel, being less than 170 miles away, so the most likely solution is that Copán’s first ruler was from Tikal but crowned at Teotihuacan. Teotihuacan operated a vast trade network which would have benefited greatly from a constant supply of jade, something that the disorganised tribes of the Motagua Valley and Copán region were possibly unable to maintain due to political instability, raiding and piracy. 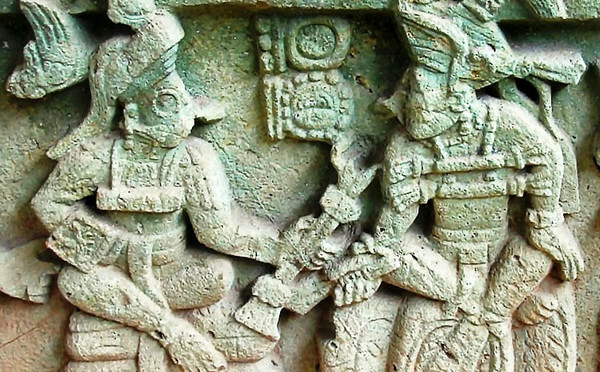 Evidence of a Teotihuacano presence at Tikal in the late 4th century, raises the possibility that Teotihuacan was manoeuvring itself ever closer to the source of the jade trade, perhaps investing in the military might of Tikal as a stepping stone. 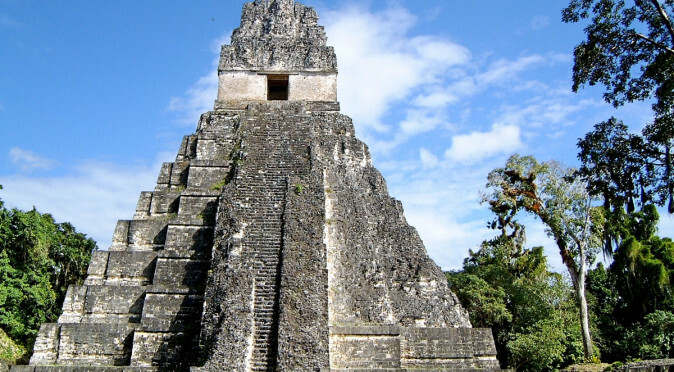 Tikal could provide protection, social order and Mayan doctrine to the far-flung jade mining region. And so it was possibly entrusted to Tikal to set up Copan, and nearby Quirigua, and set about introducing the mass production and exportation of jade to the Teotihuacano. W1106Y: Lid featuring Yax K’uk’ Mo’ from Temple Whoever he was, K’inich Yax K’uk’ Mo’ must certainly have been someone special, as he founded a divine lineage at Copan that was immediately respected and would remain so for four centuries. No defences had to be added to the city, despite the first ruler moving in to lay claim to an already settled area. He was married to a local girl, which may have been arranged politically prior to his taking the throne. It also appears that the locals chiefs became feudal lords who were given land, titles and benefited hugely from the Maya taking control of the area and the trade network. 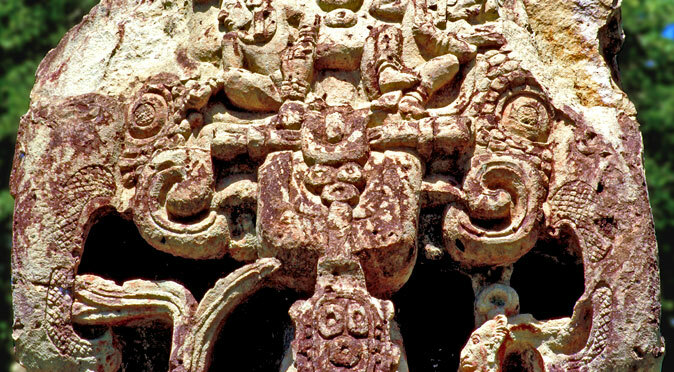 A building added later in Copán’s history is known as the “Popol Nah” or Community House and was the place where these lords met. 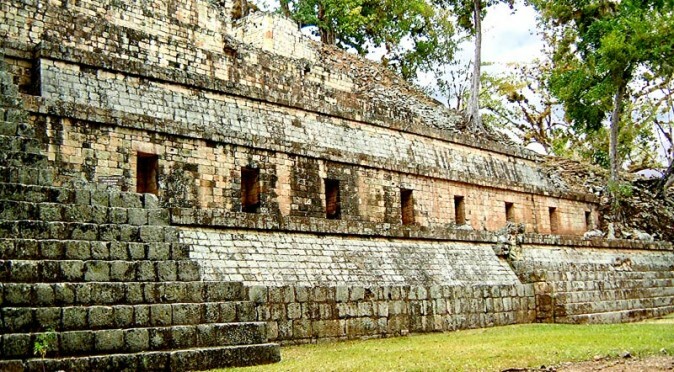 Inscriptions on the building tell us that a “Council of Nine” met there, and between them they controlled Copan’s periphery settlements, which at their zenith had a population of 20,000. The early rulers of Copán clearly enjoyed financial stability and safety, which enabled them to develop a highly sophisticated society and develop new forms of art and religious philosophy. They also introduced new elaborate forms of glyphic writing and improved the Mayan understanding of the cosmos and calendrics. 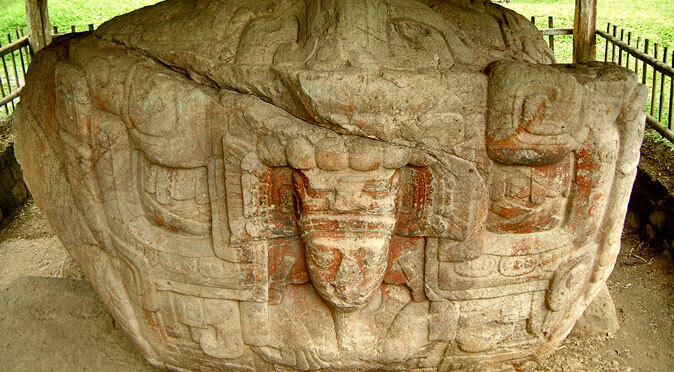 In brief, Copan became a safe haven where artistic expression and education flourished. W0969: Cauac Sky from Quiriguahim in an act of sacrifice designed to transfer the divine rulership to K’ak’ Tiliw Chan Yopaat and allowing him to claim independence from Copan. Quirigua also took control of the lucrative trade route along the Motagua River, leaving Copán without their God-King, humiliated and financially ruined. Incredibly, this act of treason went completely unretaliated and K’ak’ Tiliw Chan Yopaat went on to rule at Quirigua for another 50 years without needing to build defences or being involved in any wars. This raises some serious questions as to how and why the tiny town of Quirigua and it’s unknown vassal lord, Cauac Sky, were able to topple one of the four largest cities of the Maya. One suggestion is that the attack was funded by Calakmul and designed to inflict further misery on their arch-enemy, Tikal. Another suggestion, as evidenced by 18 Rabbit’s own rendition of his lineage on the Hieroglyphic Stairway, is that he and Cauac Sky were related, with Cauac Sky possibly being the legitimate successor to the throne at Copán. With Cauac Sky being greatly offended at being sent to rule the minor town of Quiriguá, he took revenge in a family feud that didn’t need to be avenged further by his own relatives at Copan. Whatever happened, it seems certain that the stonemason’s and master craftsmen also left Copan for Quirigua, either forcibly or voluntarily, as the construction of buildings and monuments ceased entirely for the next 17 years. Meanwhile, Cauac Sky went on to build monuments that were even more impressive than those of Copán and far beyond those seen at Quirigua prior to this event. 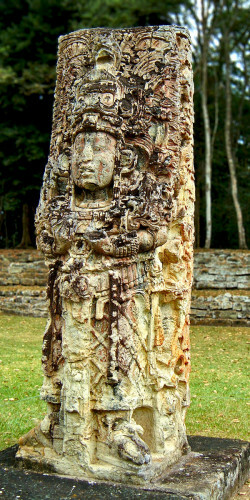 Two more rulers passed at Copan during this hiatus, K’ak’ Joplaj Chan K’awiil (738AD), followed by his son, K’ak’ Yipyaj Chan K’awiil (749AD). This was a fairly uneventful period, with the city’s finances heavily effected by Quirigua taking control of the Motagua River. However, K’ak’ Yipyaj Chan K’awiil did manage to rebuild Structure 26 and reinstate the hieroglyphic stairway having doubled its length and adding five life-size statues of seated kings within it. Yax Pasaj’s Portal to the Underworld Then, a mysterious newcomer came to the throne in 763AD aged just 9 years old. Named Yax Pasaj Chan Yopaat, he chose to inscribe the city’s buildings with hieroglyphic texts and built small altars rather than the expensive stelae that that his predecessors had. This included the infamous Altar Q, which lists all 16 dynastic rulers, including himself. Altar Q was a small part of a much larger plan to associate himself with the divine lineage of K’inich Yax K’uk’ Mo’, as he was the son of a Palenque noblewoman and his father was not the previous ruler, K’ak’ Yipyaj Chan K’awiil. The project dominated the West Court, with Temple 11 being built as a portal through which he could access the underworld, which the West Court symbolised, and meet with K’inich Yax K’uk’ Mo’ to receive the royal sceptre directly – an event that is depicted on Altar Q, which is placed at the foot of the western face of Temple 16, where K’inich Yax K’uk’ Mo’ was buried. 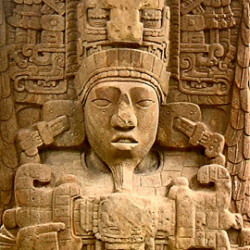 Yax Pasaj Chan Yopaat also forged a new relationship with Quiriguá and curiously, despite Quirigua having their own divine royal lineage thanks to Cauac Sky, Yax Pasaj Chan Yopaat held the K’atun ending ceremony in 805AD at Quirigua and not at Copán. This perhaps suggests his obligations lay with Quirigua foremost, but could also be indicative of the decline at Copan, which had become over-populated and under supplied – and possibly on the brink of civil war. There is strong evidence that during Yax Pasaj’s reign, the Council of Nine diminished and some of the feudal lords announced their independence by erecting their own monuments within their satellite townships. 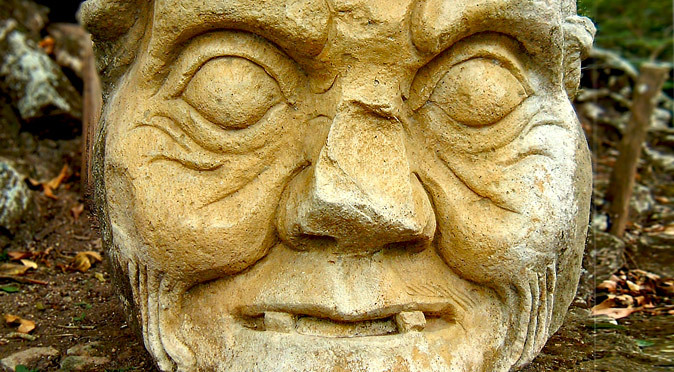 By the time the 17th ruler, Ukit Took’, came to the throne in 822AD , Copan was in serious decline. Ukit Took’ started to build a similar monument to Altar Q, but it was never finished and this marks the end of the dynastic era at Co pánand began the dissolution of the City-State. The city was inhabited for a further 80 or so years though, but the Classic Maya Collapse meant the city could no longer be supported and the population dispersed. 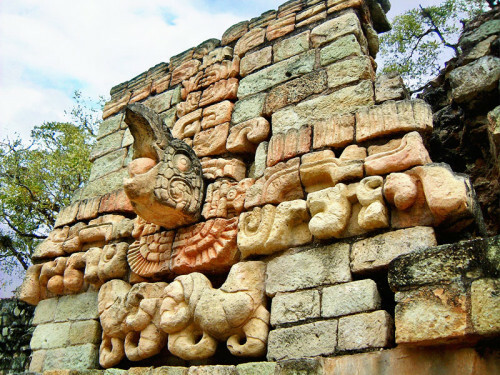 In summary, Copán was a frontier town, built by the Maya, probably under the instruction of Teotihaucan, to control the jade mines and trade that flowed down the Copan and Motagua rivers. But its mysterious founding and divine lineage make it a city of incredible intrigue. Add to this the relationship with nearby Quiriguá and the curious capture and beheading of 18 Rabbit, and you have a real royal murder-mystery to add to its mystique. 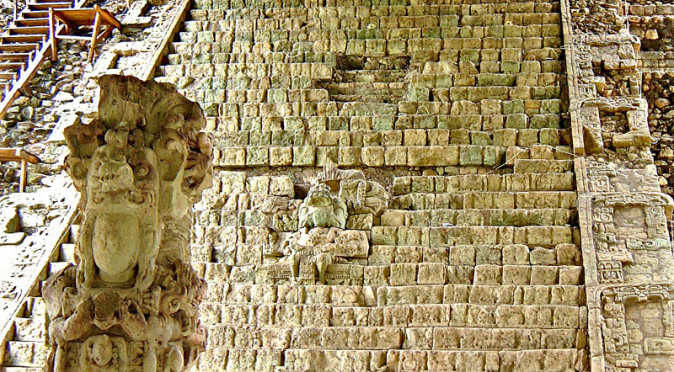 To top it off, Copán’s wealth and security made it a industrious hive of artistic, scientific, architectural and theological activity, where new ideas were born and built to create one of the most incredible cities ever discovered in Mesoamerica.